In early 1800s England, Jess Beauchene has spent most of her life in hiding and always on the move in an effort to leave her past far behind her. But when she learns the family she thought had died just might be alive and in danger, she knows her secrets can only stay buried for so long. Derek Thornbury loves the past, which has led him to become an expert in history and artifacts. He knows Jess has never liked him, but when she requests his help deciphering the clues laid out in an old family diary, he can't resist the urge to solve the puzzle. As Jess and Derek race to find the hidden artifact before her family's enemies, they learn as much about each other as they do about the past. But can their search to uncover the truth and set history right lead to a future together? Kristi Ann Hunter graduated from Georgia Tech with a degree in computer science but always knew she wanted to write. Kristi is the author of the Hawthorne House series and a 2016 RITA Award winner and Christy Award finalist. She lives with her husband and three children in Georgia. Find her online at www.kristiannhunter.com. 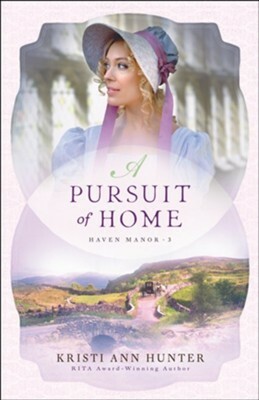 I'm the author/artist and I want to review A Pursuit of Home (Haven Manor Book #3) - eBook.